A masterful return from one of the most famous kits ever made. Few drum kits achieve legendary status. Gretsch's round-badge Broadkaster, Ludwig's Super Classic. Add to those Yamaha's Recording Custom, commonly called the Yamaha 9000. Starting life in the mid-1970s, it had set new standards by the early 1980s with its piano lacquered all-birch shells and full-length flush-braced lugs. Yamaha called birch the 'recording' wood, focused and punchy, 'pre-eq'd', even! Securing Steve Gadd as its main champion was the final masterstroke, Gadd being the most influential drummer of his era. Gadd changed the way drummers play and the 9000 changed the look and sound of drum kits for a decade. 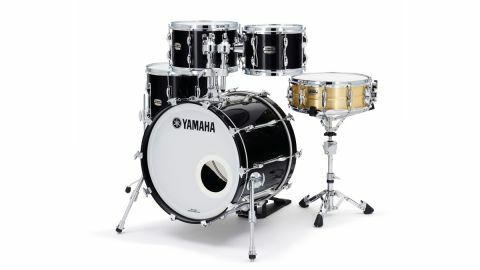 But time moves on and the RC was finallydiscontinued in 2012, coinciding with Yamaha moving production of its professional drums to its new super-factory, Xiaoshan Yamaha, in Hangzhou, China. The output so far has yielded three contrasting professional kits - the warm and deep Live Custom Oak, the super-resonant Maple Custom Hybrid, and now the updated, focused Recording Custom. Once more designed with input from Steve Gadd, the new RC retains its original qualities, but is updated with a fatter, weightier lug, thinner bass drum shells, sharper bearing edges and even greater manufacturing precision. Back in the 1980s the RC was a sensation with the never-before-seen lavish quality of its paint lacquered shells, the same lacquering that Yamaha applies to its pianos. So it's fitting we have for review a selection of the new Solid Black lacquered drums. There are just three other finishes: Classic Walnut, Real Wood and Surf Green. "Wielding a ruler over the shells confirms they are exactly round. And for once I do mean exactly." Inside, the shells have a mid-brown matt stain, again similar to the pianos. There's a new badge, understated as ever, but proudly stating 'Made In China'. Shells are all six-ply, 6mm birch. The original RC used broad-leaf Hokkaido birch, but from now on the shells will feature North American birch as a steady supply of high quality timber has been secured. One big plus of the new Chinese facility is a continual tightening of manufacturing and quality control tolerances, which were already industry leaders. Yamaha's Air Seal shell technology with angled seams (Yamaha features from the beginning) ensure near-perfect shell construction. Wielding a ruler over the shells confirms they are exactly round. And for once I do mean exactly. Inevitably the bearing edges are equally finely cut and finished. They rise 30° from the inner surface, steeper than the previous 45°, with a single-ply outer bevel. The obvious change is in the lug, which is a bloated version of the original high-tension, full-length design. All the chromed fittings and castings are lustrous. Yamaha's chrome is quite rightly legendary. The 20"x16" review bass drum has a new pedal lift bracket bolted to the batter hoop. This is a request from Steve Gadd and is available on the 18" bass drum too. The idea is to enable the pedal beater to strike at the centre of the head so that it feels similar to playing a 22" drum. Bass drums also have comfy 'T' handle tensioners, rather than now-standard drum key bolts. They are quite small, easier and quicker than drum-key operated screw bolts, with elaborately moulded lightweight black insert grommets. The review floor toms have traditional legs - not as funky as the original Gadd-inspired floor tom stands, but more stable. There are also seven new RC snare drums with stainless steel, aluminium and brass shells. Look out for a full review soon, but meantime here's the 14"x5" in 1.2mm-gauge brass, finished in a natural satin-matt 'Hairline Clear'. Bearing edges are 45° and there are 2.5mm snare beds. The crucial new feature is the Ludwig-like convex (outer) centre bead, which is again a suggestion of Gadd's. Since the original RC, Yamaha has developed mostly ever-smaller lugs, honing in on lab-tested nodal point positioning. Here the opposite tack is taken with a massive full-length lug, more bulbous than the original. The lug bucks the trend in that it sets out to contain and focus the resonance. The 9000 was described as the recording drum and birch gained a reputation as the 'focused' wood with a darker fundamental tone than maple. Add to this the shell-enclosing effect of those lugs, which allows the head tone to come through more. Choice of head becomes paramount and most will be happy with the supplied Ambassador Coated batters. With the perfectly round shells, sharp, level edges, and standard 1.6mm steel hoops, tuning is easy as ever, and the tuning range as wide as it gets. The interval encompassed by a full turn on the rods takes you from deep roaring blast to high pinging bebop, clean and controlled. This adaptability of head choice and tuning range are strengths of the RC. We'd be lying if we said we detect any great difference from our own 1983 Yamaha 9000 toms. If pushed, the new ones are slightly snappier with their sharper 30° edges. They sound superb anyway. "The 9000 was described as the recording drum and birch gained a reputation as the 'focused' wood with a darker fundamental tone than maple." The shallow classic depths give the extra punch that is also characteristic of RCs. Gadd popularised the 10" tom at one end and the 14" floor-stand mounted tom at the other. There is so much tone in that little 10"x7", it's a right little belter. And the new 14"x13" has that speed of action and arrested sustain that characterised the 9000 Gadd sound. We also preferred the 16"x14" floor tom to our 1980s 16"x16" as it also has that bit more control and immediacy. When the fashion shifted back to maple in the 1990s, Gadd eventually opted for a maple bass drum which he felt had more bottom/warmth. Thus one main brief for the new RC was to boost the birch bass drums by making the shells six-ply where they were previously a slightly thicker seven. It's a subtle adjustment and the feel will never be as open as maple. We always liked the 9000 bass anyway, which is focused like the toms, and first impressions of the new kick is of an intense, dark, fast-responding and piercing tone. Barely space for the briefest word about the 14"x5" brass shell snare drum. For the first time it has a convex perimeter bead, like Gadd's favourite Ludwig SupraPhonic. The 'Q'-type strainer is superbly engineered and the 5" drum also came with a choice of 20-strand snare or 10-strand Steve Gadd-type snare. (The 6" drum has a 25-strand snare.) Swapping to the 10-strander the sound becomes crunchier, a little harder and more discreet, actually recognisably Gadd-like.